Universal Pictures’ 2012 thriller Battleship has been slated for release to 4k Ultra HD Blu-ray on January, 17, 2017. The 4k release will feature High Dynamic Range (HDR) color for TVs that support the format (4k HDR TV, Ultra HD Blu-ray player, and high-speed category 2 HDMI cable required), and high quality soundtrack in English DTS:X Master Audio and DTS Headphone:X formats. 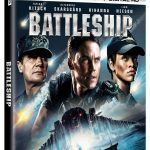 Battleship was directed by Peter Berg (Lone Survivor) and stars Taylor Kitsch, Alexander Skarsgård, Rihanna, and Oscar-nominated Liam Neeson. While the film was a huge box office flop for Universal, it might be one of those films to revisit for the production value alone (estimated at about $220M not including advertising). Five years after the film debuted in theaters in May, 2012, TVs now display 4-times the resolution of 1080p sets that were the standard at the time. 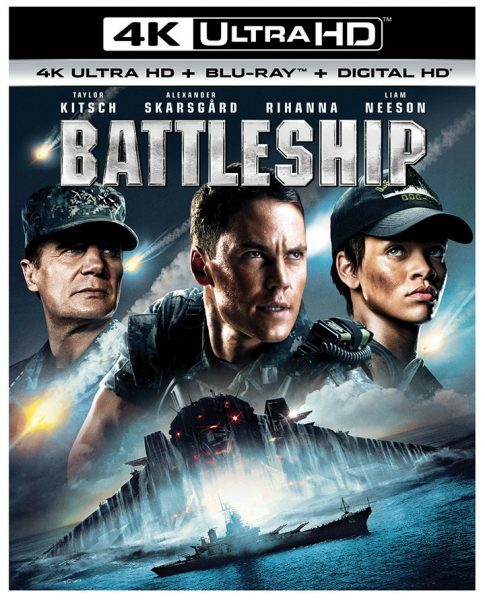 As well as offering 2160p resolution, Battleship on Ultra HD Blu-ray will also expand the color range, contrast, and detail of shadow and light areas with the use of HDR specifications. Unfortunately, the 4K TV must also support HDR. Battleship is encoded in HDR10 (one of the two HDR specs, the other being Dolby Vision), and luckily most HDR TVs support both formats. 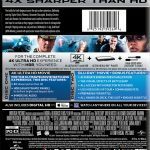 The Ultra HD Blu-ray edition of Battleship will also include several bonus features such as an alternative ending previsualization, “All Access With Director Peter Berg,” and several featurettes. The UHD BD combo comes with a 1080p Blu-ray copy and Digital HD copy through iTunes and UltraViolet. Learn more about HDR and Ultra HD Blu-ray.